When I was two, I was bald. So my mom did all she could to make my hair grow. She used every type of herb you can find, convinced by the myths that they can make hair grow faster and thicker. From the sticky paste inside an aloe vera plant to candlenut jam, she used them all. Now as crazy as that might sound, the result is much crazier. At first my hair was normal and straight, but then as I grew older it became thick, wavy and volumized. Not to mention I grew up in Indonesia, a very humid country all year round. Since my transformation, I had no choice but to tie my hair into a ponytail almost everyday. What’s worse is that my hair also has a rough texture and is always frizzy. I tried almost every hair product out there from different shampoos and conditioners to spray and cream hair products. All the results ended up the same until I discovered the magic of argan oil. 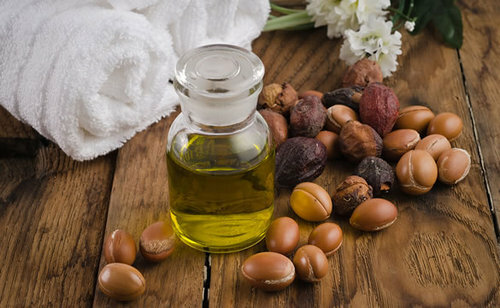 Argan oil is also known as Moroccan oil because it is made from argan trees that can only be found in Morocco. The benefits of argan oil are endless. This sultry, gold fluorescent oil gives benefits to not only the hair, but the face and the body, too. I wanted to use an argan oil product on my hair as frequently as I wash it, so I decided to save. I bought Renpure’s Organics Argan Oil Deep Penetrating Reconstructor, which is a deep conditioning cream used on damp hair for three to 30 minutes. The ingredients of Renpure’s Argan Oil are organic and free from harmful chemicals. It contains various vitamins and minerals to transform the hair into becoming generally healthier, and they do. After using this product a couple times, my hair is shinier and smoother than ever before. I can FEEL that my hair is healthier. Renpure’s Organic Argan Oil also repairs dry and split ends caused from hair dryers and straighteners, which I use almost everyday to help tame my hair. The best part: it’s only $5.99! To splurge, one of the best high-quality cosmetic brands out there, Josie Maran, sells 100 percent pure argan oil that can be used on skin, hair and nails. It is ideal to enrich almost every part of your body and to get the treatment right at home. The catch: it costs $14 for only 0.5 ounces of oil. It’s a natural genius, I promise you. So will you save ... or will you splurge? Argan oil is an excellent product.. For this, we find a very high price in the market.